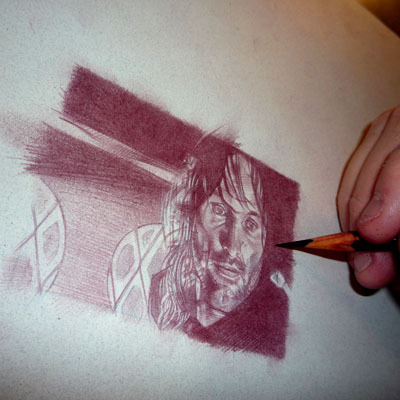 Aragorn is coming along nicely, finishing up the pencils and getting ready to do the highlights. Just thinking, while I'm looking out the window here at the Library. Its a beautiful day here in Boulder, Colorado. I can see the Boulder Creek from here and people are already showing up with inner tubes. Every year mobs of people tube the creek and every year, when the spring run off comes rolling out of the rocky mountains like team of Clydesdales pulling a stage coach, somebody drowns, or a couple of people get hurt, or somebody looses thier pet or kid. Basically, some huge terrible disaster happens and then the city bans tubing in the creek and its a whole big thing. Not sure where I was going with that, but I guess every post can't be about art.